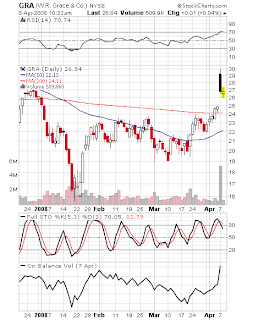 There is a lot to like about the breakout in GRA. The stock gapped up 3 points on huge volume over price resistance and had mounted the 200 day moving average a couple of days before. the 50 day moving average is moving up and looks ready to cross the 200 day. RSI and stochastics show significant strength. OBV is breaking out. Looks like the perfect breakout or breakout-pullback play. What stopped me from making the trade is the fact that the stock did not close near the high of the long bar. That’s quite early for profit taking on a breakout, so I decided to pass. I have never tested breakouts that close near the low of the day, but still gap over resistance. This will likely be my next research project.